This spectacular and fun event and attracts as many as 2,000 participants and their dogs and provides a major source of income for a charity that relies solely on donations and such fundraising events to be able to operate. 100% of all money raised will go towards funding vital basic costs including veterinary care, purchasing of dog food, beds and kennel supplies, as well as the upkeep of our two Homing Centres at Tai Po and Ap Lei Chau. The programme for the day starts with the Sponsored Walk down from The Peak, and continues with fun and games at Lan Kwai Fong, including a variety of live entertainment, merchandise stalls, food and drink. 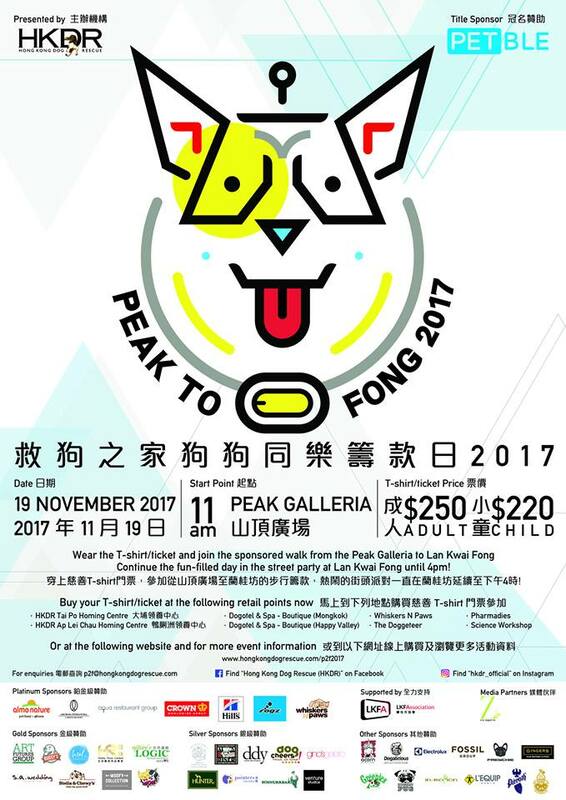 We welcome people and dogs of all ages to join the Sponsored Walk down from The Peak to Central, or to just join in the party fun at Lan Kwai Fong! G/F, 122B Argyle Street, Mongkok. BUY YOUR T-SHIRTS NOW to get ready for the biggest, best and most exciting Peak to Fong ever!